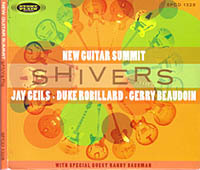 Duke Robillard joins up with Jay Geils and Gerry Beaudoin once again as New Guitar Summit for a new album, Shivers. In the second album by the trio of stellar guitarists, covering classics such as “Flying Home,” “Honey Suckle Rose” and “Broadway,” Robillard, Geils and Beaudoin come together to play a rousing set of vintage jazz and blues. Produced by Jay Geils, the album also includes four original songs between the New Guitar Summit members and features Canadian rocker Randy Bachman on two Mose Allison covers.